Link to petition - CLICK HERE: New petition is being created. In 1625 Arthur Chichester died and was succeeded by his brother Edward, Viscount Chichester of Carrickfergus. He constructed a new bridge across the Blackstaff consisting of three arches and named it 'The Great Bridge of Belfast. The structure received its first major test when Colonel Venables, Commander of Oliver Cromwell’s army, marched north from Drogheda. He brought with him a baggage train complete with heavy guns, crossed over the river and seized the town. The bridge had to be repaired afterwards. 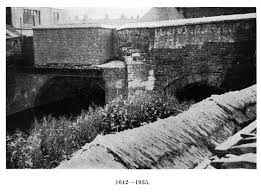 With the building of the Bridge over the Lagan in 1685 consisting of 21 arches, the word 'Great was dropped from the Viscount's bridge and it became known as 'Brickhill Bridge after the nearby 'Brick Pitts' (Moore, 1951). Another army some 45 years later crossed over the bridge with the same intention of capturing the town. This time it was an Irish army of King James, who succeeded in taking the town for a short period. He then retreated across the bridge as the army of Schomberg advanced from the north Down in hot pursuit. The strength of the arches was once again put to the test, as teams of horses dragged the heavy cannons across it. Its name appears to have been changed, some years later when it became known as the 'Saltwater bridge' in acknowledgement of the point where the tidal waters of the estuary went no farther. In 1717 the Grand Jury made an assessment for building buttresses "to support the saltwater Bridge and for other repairs above the bridge" (Young, 1896). 1he bridge lacked a footpath and used angular recesses or niches above the piers. Apart from facilitating the movement of men, animals and cannon, the bridge was used to carry water pipes across to serve the needs of the town’s population. The remains of these wooden pipes were discovered when a new bridge, christened the 'Boyne Bridge', was built across the river in 1935. The bridge across the Blackstaff witnessed the comings and goings of herdsmen and traders bringing their cattle, sheep and goods for sale at markets outside the walls of the settlement at the mouth of the Farset. It witnessed the approach of Kings and Generals, but surprisingly it was not the scene of any major battles despite its strategic location. However, it did become the scene of sectarian rioting between mobs from the Roman Catholic Pound Loney and Protestants from Sandy Row in 1864. 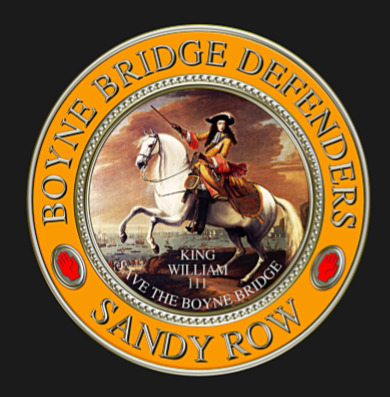 In more recent times, the bridge retained something of its former strategic importance when protests were mounted at the foot of the bridge against outsiders coming in to buy property in Sandy Row. Today the bridge from a historical perspective hides all that has happened at this crossing of ages past. All that remains are memories written down in journals and maps that bear scant testimony to the momentous events at this crossing where the tidal waters reached.